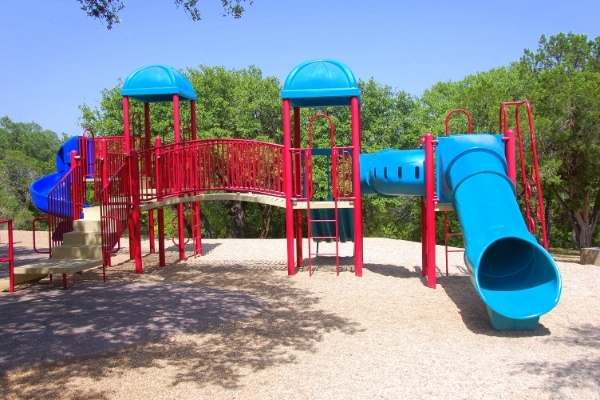 This 3282.5 acre park is located along Rock Creek, a large tributary of the Brazos River. Lake Mineral Wells was created in 1922 as a supplemental water source for the City of Mineral Wells. By 1963, the town no longer needed the lake as a water source. In 1975, the Fort Wolters Army Post closed and the U.S. Government donated some of the Fort’s acreage to the State of Texas for park use. The same year, the City of Mineral Wells donated 1,095 acres and the 646 surface acre Lake Mineral Wells to the TPWD. The acreage was combined to form the state park which opened to the public in 1981. The park is located in the Cross Timbers of Texas, and is heavily treed with several varieties of trees, including Post Oak (the oldest stands in Texas), Live Oak, Blackjack Oak, Ashe Juniper, Pecan and others. The terrain consists of gently rolling hills, many cliffs and huge rocks and crevices suitable for rocking climbing and rappelling (Penitentiary Hollow). The park is located on U.S. 180, 4 miles east of Mineral Wells, and 14 miles west of Weatherford. The 20 mile Lake Mineral Wells Trailway connects the City of Mineral Wells and the State Park to an area near Weatherford, Texas. For more information, read the Park Brochure and watch the Park Video. Located along the abandoned T & P Railroad line, this 20 mile long and 10 feet wide multi-use trailway begins northwest of Weatherford in Parker County, and runs 20 miles westward through rolling hills to downtown Mineral Wells in eastern Palo Pinto County. The first 18 miles of trailway from Weatherford are covered with finely crushed and screened limestone. The last two miles of trail approaching downtown Mineral Wells, are surfaced with asphalt. The 16 trail bridges are decked and have railings. The 500 foot signature bridge crosses over U.S. 180, and is adorned with 104 Lone Stars. The four trailheads are located near Weatherford, in Garner, Texas, in Lake Mineral Wells State Park, and in downtown Mineral Wells. Each trailhead has a paved parking lot, drinking water, restrooms and information kiosks. Horseback riding is permitted on the 14 mile stretch between the State Park and Weatherford. A fee is required and may be paid at the self-pay stations located at each trailhead, or it may be paid at the State Park headquarters. Annual passes are available. The Weatherford Trailhead is located off FM 920 northwest of downtown Weatherford. The Garner Trailhead is adjacent to FM 113, 2 miles north of U.S. 180. The State Park Trailhead is located near the amphitheater on the south side of the park. The Mineral Wells Trailhead is located adjacent to U.S. 281, 4 blocks south of U.S. 180. In 1891, the WM & Northwestern Railway built a line connecting Mineral Wells to the Texas & Pacific (a part of Southern Pacific) line in Weatherford. The T&P Railway purchased this line in 1902, and in 1908 extended it 18 miles to Graford via Salesville. Some of the line was eventually abandoned. The section not abandoned and the T&P line were merged into the Missouri Pacific line in 1988. In 1989, the City of Mineral Wells purchased the line from Missouri Pacific and operated it as the Mineral Wells, Weatherford & Eastern Railway until 1992 when the remaining line was abandoned. The Mineral Wells Trailway occupies the abandoned rail bed between Mineral Wells and Weatherford. An MW & E caboose is located at the Mineral Wells end of the Mineral Wells Trailway. From Mineral Wells, take U.S. 180 East 3 miles to park entrance. From Weatherford, take U.S. 180 west for 14 miles.